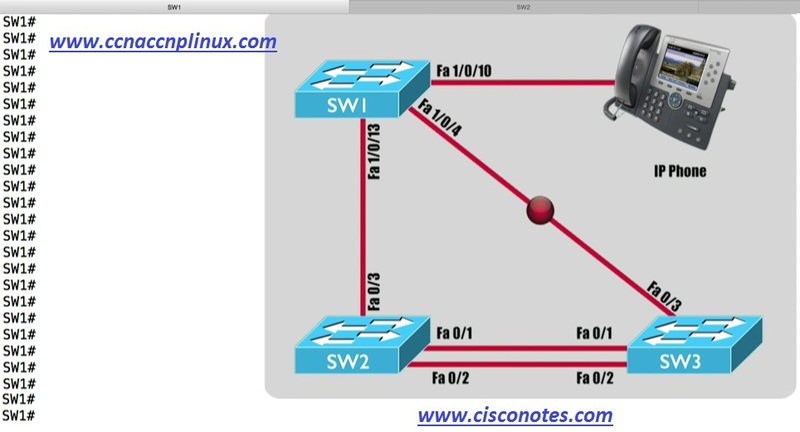 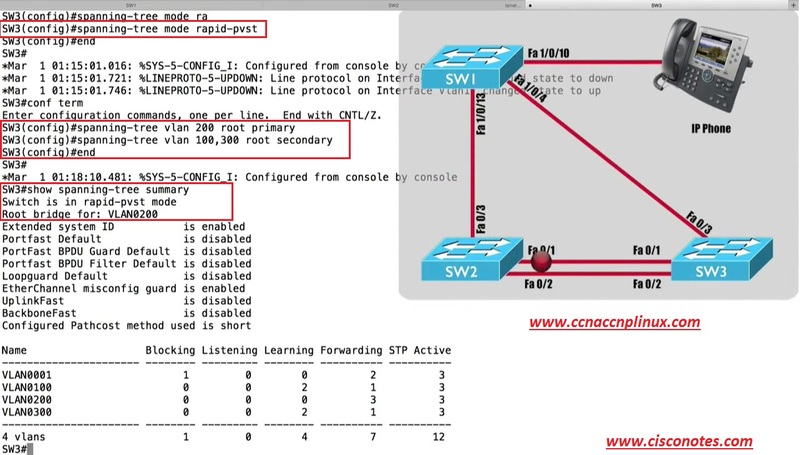 And we can see that we are the Root for Vlan 200 and on Sw1 reissue the command. 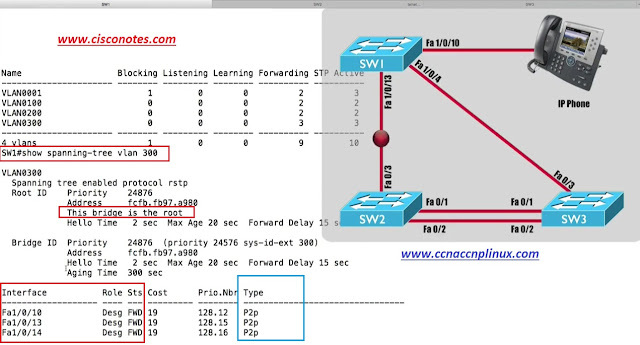 We see that, we are the Root for Vlan’s 100 and 300. 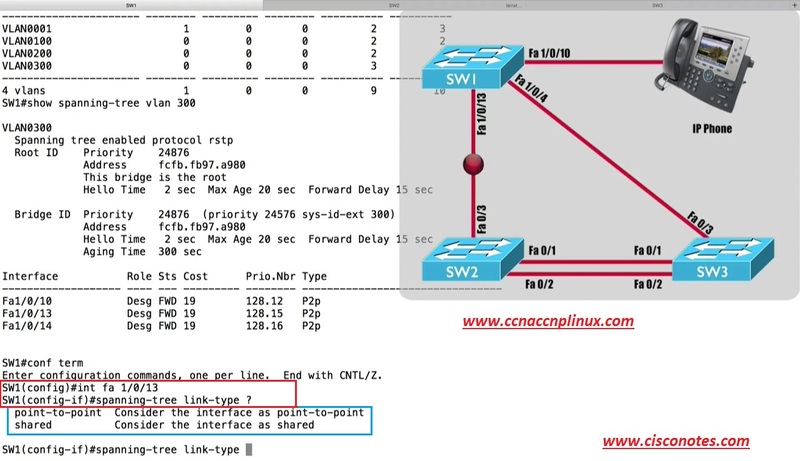 And because this is the Root for Vlan 300, you see the Port Roles is Designated Port for each of these Port’s meaning that our status is Forwarding, and the link-type are P2P, Point-to-Point, and the reason these link-type are Point-to-Point is that the Switch made that determination automatically by looking at Duplex of these ports, if we have a port in Full Duplex mode the assumption by the Switches is, we probably connected to a another Switch or may be a Router, and that’s gonna make the link-type P2P, if we were in Half Duplex Mode the Switches going to assume that we connected to a shared media segment, maybe we connected to an Ethernet Hub and that case link-type would be a Shared. But here is a challenge may be, we connected to an End User Station like a PC or here we have a Phone plugged in a fastethernet 1/0/10, and that means fastetherent 1/0/10 should be considered an Edge Port, how we say that Port is an Edge Port. Notice here, we have two option Point-to-Point and Shared, but there is no Edge Port option, we can do that to Shared, but I want to show you another approach to that. 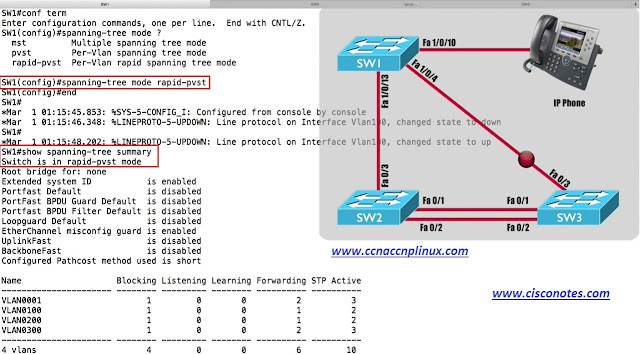 We going to enable a feature, we going to be talking about more in our upcoming Topic, but its’ called Portfast, instead of plugging in a device to Switchport and waiting through the Listening and the Learning states before we transition to a Forwarding. And now look at this, this time it’s says this is an Edge Port, meaning that when we plugged that IP Phone into a Switch Sw1 fastetherent 1/0/10 interface, it doesn’t have to wait that 30-second’s period of time to Transition from Listening to Learning to a Forwarding. It’s going to go active almost immediately and by the way, we do not have to be running Rapid-PVST+ and order to use that Portfast feature, that can be used with any of our flavors of Spanning Tree Protocol and we gonna be talking more about portfast in upcoming session. 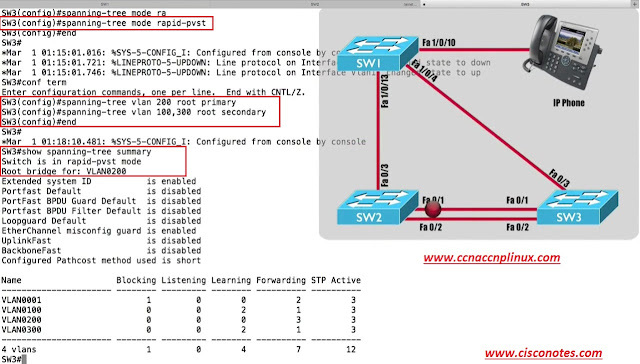 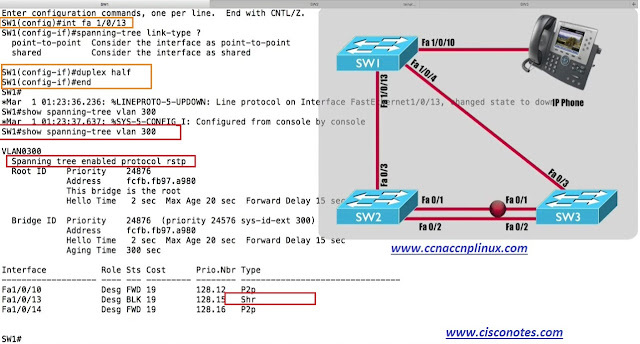 What this session done, is shown us how to very easily enable Rapid-PVST or Rapid PVST+ on our Cisco Catalyst Switches, we saw that we can influence Root Bridge Selection exactly as we done before, and we saw that Rapid-PVST or Rapid-PVST+ would attempt to automatically determine the appropriate link-type based on Duplex settings but we could go in and override that default settings, we would set the link-type to P2P or Shared. 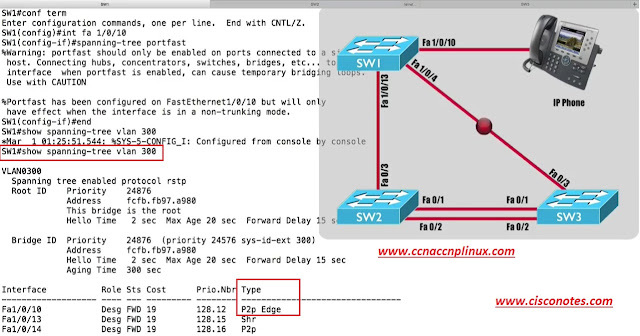 and we could also say that the Port was an Edge Port by enabling Portfast on that Port.